Safetec of America, Inc. is proud to announce its new Red Z and Green-Z Drop-In Pacs. This newly designed medical solidifier offers advanced self-dissolving technology to instantly absorb and solidify medical liquid waste. As the inventor of Red Z® and Green-Z®, Safetec strives to offer quicker and safer solutions to help workers in the healthcare industry. This product comes at a time where Hospitals, Surgery Centers and Operating Rooms are looking to promptly increase turnovers and improve worker safety, all while trying to help reduce growing healthcare costs. With these thoughts in mind, Safetec has developed a solution containing the same great effective superabsorbent polymers as used in their Red Z® and Green-Z® bottles. 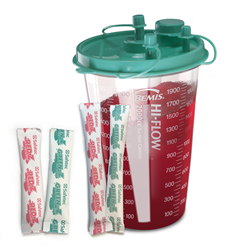 These sleek and slender pouches are specifically designed to fit in the porthole of suction canisters to help streamline waste containment in red biohazard bags, kick buckets, and wound care therapy. The Drop-In Pacs are compliant with OSHA’s Bloodborne Pathogens Standard (29 CFR 1910.1030)*. The standard’s requirements state what employers must do to protect workers who are occupationally exposed to blood or other potentially infectious materials (OPIM), as defined in the standard. That is, the standard protects workers who can reasonably be anticipated to come into contact with blood or OPIM as a result of doing their job duties. Want to try Safetec’s Drop-In Pacs in your OR? Click here for free samples. About Safetec of America, Inc.: Safetec of America, Inc. offers infection control for every industry. As a trusted source for distributors of infection control, first aid and compliance products for the past 25 years, Safetec consistently delivers the right solutions when every second counts. Customers prefer to stay with Safetec because of their constant quality, stability, and value – and great American-made products. For more information contact Safetec of America, Inc at 1-800-456-7077 or by emailing info(at)safetec(dot)com.